While the battle in Congress rages on over the Farm Bill, and the partisan divide widens over just who should get the most taxpayer funded welfare, I have been living a rather interesting life in direct contrast to all that the Farm Bill represents. In March, some good friends of mine decided to "Go Galt." They chucked it all, jobs included, and bought a small farm in the hills of Tennessee. Neither of them had ever farmed, but once they found the property of their dreams, their plans began to solidify into reality in a very short amount of time. I came to the now working farm in early June and have been here, watching their dream produce a garden, raise livestock, and make money. Enter Joel Salatin, self-described “Christian-libertarian-environmentalist-capitalist-lunatic-farmer.” Salatin is the author of "You Can Farm", among other titles, and is changing views on farming all over the world. His model of sustainable, land-friendly farming, with a focus on making a profit (yes, you read that correctly, I said "profit") is garnering attention wordwide. 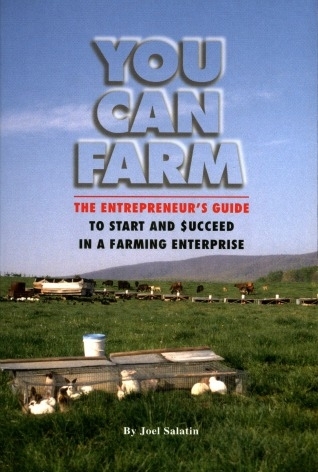 I had very little interest in being a farmer, but I began reading "You Can Farm" after my friends added his book to the very short list of reading that has "changed their lives." Considering their enthusiasm for their new life, and what I was seeing them accomplish every day, it's an understatement to say that my interest was piqued. I was hooked in the first ten pages. Salatin is bluntly honest about the challenges farmers face. From money and marketing, to public opinion and government regulation, he addresses them all head on and with no flowery-fake enthusiasm. Along the way, he also manages to remind the reader often that knowlege is king, and you will have to work for it, but it CAN be done. He knows; he's done it. His family farm model, Polyface Farms, is an inspiration the world over, and he is making millions. As a bonus, a very large portion of the information in this book can be applied to any other entrepreneural venture where the intention is to avoid being squashed by regulation and to actually make a profit. Now, if you will excuse me, I have to check on the pigs and get ready to pick berries for the value-added baked goods we also offer from the farm. Next time, I'll tell you how Salatin's model is challenging specific regulation and the force gathering behind small famers in America. Hint: It isn't Congress, or a Farm Bill; with or without Food Stamps attached. The Farm Bill is welfare for farmers. My wife and I farm and have made the decision to never take another dime from the government and always plant to our fullest potential. Other farmers only plant the bare minimum say they couldn't get to the other 500+ acres and rely on the government to pay them their crop insurance. Meanwhile government agencies like the FSA make cheap loans to giant farming corporations and deny the beginning farmer that shows how a profit can be made with no risk. Apparently, these agricultural agencies want you to show a negative profit. Why? Shouldn't they want farmers to make a profit. Someone needs to look into these agricultural agencies and blow the lid off, many of them are dated and not needed anymore. Last week, President Obama marked the next step in his second term agenda in a speech about global warming and the EPA. Today is "Equal Pay Day:" the 50th anniversary of the passage of the "Equal Pay Act" which, according to John F. Kennedy and most of his successors, was supposed to be the moment when society finally became equal and women earned precisely as much as men for the same jobs. In April 2012, 7-year-old Emily Whitehead was on the brink of death. In April 2013, Emily spoke at an American Association for Cancer Research conference - cancer-free and with a full head of hair. Let the IRS file your taxes for you. What could possibly go wrong! Regulation of alcohol in the United States uses a three-tiered system that perpetuates big business’s control on the alcohol industry and has helped maintain a cartel-like hold on the marketplace ever since the end of alcohol prohibition in 1933.